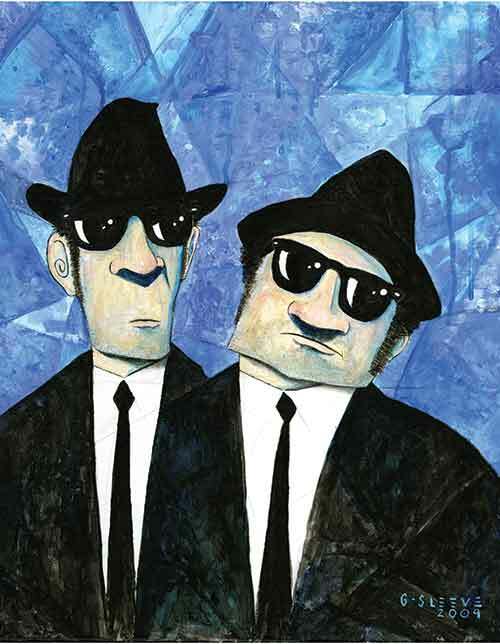 Home > G-sleeve Art > "Blues Brothers"
Who can forget the Blues Brothers? They were two unique characters from the 1980 movie of that name and they were unforgettable. Elwood (Dan Aykroyd) and 'Joliet' Jake (John Belushi) Blues stumbled their way through their efforts to help the boarding school in which they were raised, and we laughed all the way. And the friends (and enemies) they meet on their "mission from God" were just as captivating. This print is David's image of the brothers and he draws upon his wacky style to make this portrayal just as unique and comical as they were on film. But there's no denying that it is Elwood and Jake Blues. The movie begins with Jake Blues being released from prison and he and his brother Elwood go to visit "The Penguin", the last of the nuns who raised them in a boarding school. They learn the Archdiocese will stop supporting the school and will sell the place to the Education Authority. The only way to keep the place open is if the $5000 tax on the property is paid within 11 days. The Blues Brothers want to help, and decide to put their blues band back together and raise the the money by staging a big gig. As they set off on their "mission from God" they seem to make more enemies along the way. Will they manage to come up with the money in time?